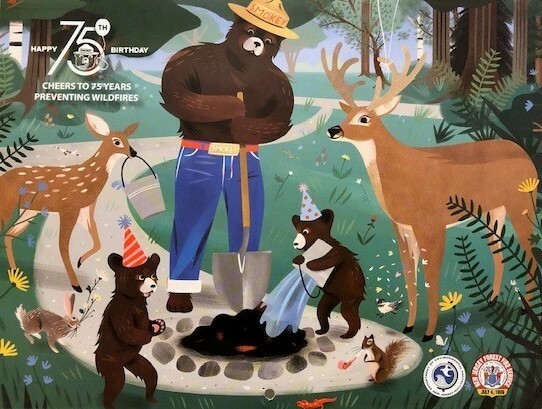 (19/P007) TRENTON – Free calendars designed by New Jersey schoolchildren that highlight the importance of wildfire prevention and celebrate the 75th anniversary of Smokey Bear are available to the public, the Department of Environmental Protection announced. 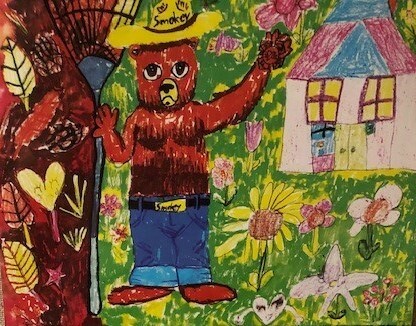 Approximately 200 children from public and private schools across the state submitted entries for a calendar contest with a dual theme of celebrating the 75th anniversary of Smokey Bear and calling attention to the importance of wildfire prevention. Although Smokey’s officially recognized anniversary is in August, the traditional start of wildfire season in New Jersey begins in April. The Forest Fire Service commenced the contest in October 2018 to coincide with New Jersey’s designated fire prevention week. A committee of firewardens from the Forest Fire Service’s northern, central and southern regional offices and other Forest Fire Service staff judged the contest entries without knowing the names or schools of the artists. They chose a grand prize winner, 12 winning entries for each month of the calendar, and six honorable mention winners. The Forest Fire Service provided a certificate to each winner and an allotment of calendars to their schools for distribution. Smokey Bear, accompanied by a Forest Fire Service firewarden, will visit each of those schools. The winning artists are Yuni Banyai of Berlin Community School (January); Roxanne Campbell of Middle Township Elementary School #2 (February); Soyoon Ahn of Berlin Community School (March; also Grand Prize Winner); Zachary David II of Berlin Community School (April); Kiera Collins of Middle Township Elementary School #2 (May); Camila Lopez of Crest Memorial School (June); Graham Curley of West Cape May Elementary School (July); Iman Hussain of Noor UI-Iman School (August); Fiona Hardin of Middle Township Elementary School #1 (September); Jayden Ekweony of Franklin Elementary School (October); Winnie Banyai of Berlin Community School (November); and Alice Pagan of Dr. William Mennies Elementary School (December). Honorable Mention winners are Seth Migliaccio of Middle Township Elementary School #1, Matthew Chin of Middle Township Elementary School, Alex Leora of Warren E. Sooy Elementary School, Geneva Blight of Eagleswood Elementary School, Zoe Peterman of Middle Township Elementary School #1 and Edwin Silva of Dr. John H. Winslow Elementary School. Division C Office: 5555 Atlantic Avenue, Mays Landing, Atlantic County. Supplies of the printed calendar are limited and are available first-come, first-served. Smokey Bear’s public awareness campaign has evolved over the years from focusing on prevention of forest fires to prevention of wildfires, due in part to significant outbreaks of wildfires in natural areas other than forests. The current message also clarifies the difference between prevention of unwanted and unplanned outdoor fires versus prescribed burns, which are intentionally set by firefighters to burn away materials that could accelerate a wildfire. To learn more about the New Jersey Forest Fire Service and how to prevent wildfires, visit www.nj.gov/dep/parksandforests/fire/. For more information about Smokey Bear and the “Only YOU Can Prevent Wildfires” campaign, visit www.smokeybear.com.